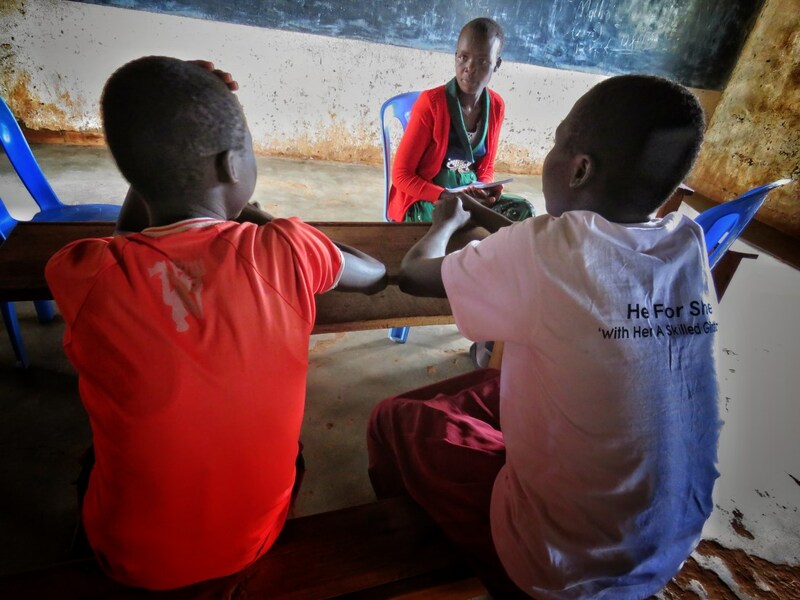 Sabina, a 15-year-old girl in West Pokot, Kenya, has escaped a forced marriage and is working to prevent other girls from undergoing Female Genital Mutilation or Cutting. Sabina was married off immediately after undergoing FGM/C at age 13. She recalls that sorrowful day: "I just heard from my siblings that someone was bringing beer home (a sign of people coming for a bride), and in no time I was whisked away forcefully by several men." Sabina tried three times to leave her husband's home, but was returned. The fourth time, she fleda s far as possible, so he couldn't trace her. She went without food and slept in trees.Thankfully, Morpus Primary school, where World Vision has been working with the community, is known as safe place for children like her. After only a few weeks at Morpus, she topped her class, though she had missed school for a year. Sabina is confident, bright, and demonstrates a sense of purpose on her face and in her tone of voice. Even though she experienced FGM/C and child marriage, her life is being restored through the work of World Vision Child Protection and Education projects. Now Sabina worries about her younger sisters and other children around Kachelipa where she hails from who remain under the shadow of FGM/C and forced marriage. Threats to children like these are many and represent much of what's broken in our world. World Vision is working hard to make life better for them. Sabina comes from a very poor and vulnerable family. Her parents struggle with alcohol abuse and could not provide for the all the family's needs. Both her parents and her village are strong adherents to FGM/C. In addition to Sabina's marriage, her brother, Kibset*, 13, was sent to work for a neighbor as a herds-boy. He also fled and is with Sabina in Morpus School, in class 6. Sabina sobs when she remembers how she hugged her brother on the day he arrived at school. While she is glad he has hope for his future, she is sad because her younger sisters are still vulnerable to FGM/C and child marriage. World Vision confronts violence against children and spreads the message of child protection to local and county authorities. We empower children to protect themselves and others. We work with churches and other faith communities to mobilize them to change parents' behaviors and end harmful practices. Now that she's free and back in school, Sabina can dream again. She is quick to say, “I want to become an ambassador or work for World Vision.” She has been trained through the alternative rites of passage program to teach children how to protect themselves from child marriage and FGM/C. Her advice to other children is to stay away from those practicing FGM/C and report them to authorities.